You know I can’t resist a book about cats. The cover alone on this one got my attention. I think it’s adorable. Even better is the wealth of information jam-packed into this book. The author obviously knows her topic very well and presents it in a way we can all comprehend. For anyone who has a cat or ever thought about getting a cat, this one is for you. It provides you with everything you need to know about training cats (not an easy task) and gives you some history and background on the origin of cats and their behavior. It gives readers more of an understanding about where their cats are coming from. If you ever wondered “Why does my cat do that?”, chances are it’s covered in this book. It’s kind of a manual for humans who are owned by cats (I don’t like to say cat owners because cats are usually the ones in charge – LOL.) 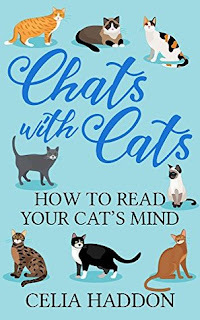 This book is particularly helpful for new cat owners or anyone with a new kitten. This is must reading for cat lovers! FTC Disclosure: NetGalley provided me with a copy of this book to review for this blog tour. This did not influence my thoughts and opinions in any way. All opinions expressed are my own. This sounds like a book I need to read. My son's cat is always doing weird things. I will have to look for this in hardcover. There is a similar title - HATS for cats but I bet other than that they are not at all alike. This sounds like a lot of fun and a perfect gift! I'm not sure I can resist it either. Cute cover and the book sounds good. I can always learn more about cats.